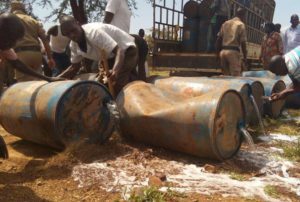 Drums of alcohol being destroyed by policemen in Karamoja. Despite the tough measures, illicit and sachet waragi find their way into Karamoja. Photo by Daudi Nana. MOROTO–More than 34 people admitted at various health facilities in Karamoja sub region died this year after abusing alcohol, a new report has revealed. The report, a copy of which PML Daily has seen, indicates that an estimated 848 people were treated and rehabilitated at various health facilities within Karamoja sub-region while 653 were admitted due to alcohol abuse this year, up from 175 in 2014/15. The report tabled before the EU delegation last week by Moroto Diocese health department titled; Increasing problem of alcoholism in Karamoja, also shows that men accounted for the majority of these admissions (65 per cent) compared to women (35 per cent). The report shows that hospital admissions and deaths from alcohol-related illnesses and injuries continue to increase every year among adults and the young in Karamoja, with men disproportionately affected. The European diplomats were in Karamoja for their annual retreat and to appraise themselves with the development challenges and opportunities in Karamoja and listen first-hand to the concerns of all stakeholders in the sub-region. The report reveals that cases of alcohol abuse in all the health units of Moroto Diocese moved from 81 in 2014/15 to 655 in 2016/16 financial year. Dr Rossanigo said a survey which focused on “evidence based” data was commissioned by the diocesan health department and an external doctor with experience in the field of alcohol addiction invited to help in the survey and to study the problem in detail. “We found out that drinking is especially damaging to health for the people of Karamoja and alcoholism is leading to various health problems but mainly to serious liver diseases and Matany Hospital recorded a worrying increase of deaths due to liver diseases (excluding hepatitis and cancer of the liver),” said Dr Rossanigo. Dr Rossanigo said alcoholic liver disease accounted for nearly two-thirds (63 per cent) of all alcohol-related deaths. He revealed that the survey also found out that the Psychiatric Ward of Moroto Regional Referral Hospital had 17 cases of patients treated because of mental illnesses related to alcohol. The LC5 chairman Moroto District, Mr Andrew Napaja, said alcohol and drug substance use in Karamoja is seen as the leading cause of domestic violence, HIV/STIs infection, early marriages and teenage pregnancies. “Alcoholism has led to poor health, poverty and crime rate among men and women in the community, it will kill most of our people unless government steps up efforts to stop production of the cheap sachet waragi,” said Mr Napaja. He explained that alcohol sold in sachets has become a danger especially to the youth because it is cheap and easily accessible, with the smallest sachet of 100ml going for only Shs500. The government gave alcohol manufacturers up to September 30, this year to stop the sale of alcohol packaged in sachets but three months after the deadline, there is nothing in effect. This is one of the resolutions agreed on in a meeting between the Minister of Trade, Industry and Cooperatives Amelia Kyambadde and members of the Uganda Alcohol Industry Association at the ministry offices in Kampala. The head of EU delegation H.E Ambassador Attilio Pacifici said many of the illnesses such as heart disease, liver and cancer are experienced by people who may be unaware that their drinking is damaging their health. “There is relationship between economic development, alcohol consumption and alcohol-attributable burden of disease is interrelated,” he said. The French ambassador to Uganda, Ms Stephanie Rivoal, described consumption of alcohol in Karamoja sub region as a beverage of choice for the Karimojong because of lack of food. “There is widespread abuse of the production and consumption of alcohol, which poses health, safety, social and environment problem to the entire public and communities – especially the youth. And when I hear about Karimojong taking alcohol, I feel like crying. How do you give people alcohol in exchange for labour, how do people take alcohol like food, I think government should ban alcohol in this country,” said Ms Rivoal.